Login above, or click here to register. Getting started is simple, you can be gathering the information you need in minutes! If you already have a login and password for our MapWarehouse, you can use the same information to login and create your VuMap subscription! 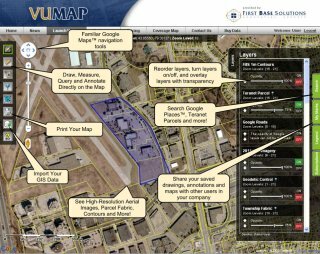 VuMAP is an online mapping application that provides access to the library of high-quality, high-resolution aerial imagery acquired by First Base Solutions. VuMAP works through your web browser, using the familiar Google MapsTM and Google Street ViewTM controls and search, and does not require any plug-ins or installations. Whether you have an ongoing need for land information or have a small project spanning a few days, VuMAP's flexible subscription options and 24/7 online accessibility will allow you to get the information you need to make informed decisions, on time and on budget. VuMAP isn't just a viewing tool; it includes a number of easy-to-use tools to help you get the most out of your data. Measure distances, draw/trace objects, label features, perform layer queries, advanced search functions, save/print views, and share data with other VuMAP subscribers in your company. View information online, print it, export it for use in presentations and documents, or store your customized settings for future reference. One year subscription with unlimited usage. New subscriptions can be purchased online using a credit card.